Ludlow Green Man carving. Photo by SiGarb. In Robert Holdstock’s Lavondyss, a daurog is a Mesolithic green man. It’s an agglomeration of man, wolf, owl and vole bones, with seeds germinating within the vole remains and shooting up through the layers of remains to festoon the entire body. As the seasons progress, the daurog’s foliage follows the cycle of flowering and shedding. To Ice Age hunters, a daurog might be a tormenting force of nature, an oracle offering cryptic wisdom, their own antecedents and who knows what else. “Beast Man” of Vermont Glimpsed! What is this critter? And what's that hump-like thing? Squatchdetective.com has an investigation going on a trail camera in Vermont that picked up some sort of furry/hairy-ish thing. It could be a Green Mountain bigfoot or maybe one of the “wild men” prowling an abandoned side path of the Long Trail. Whatever it is, it’s hungry. The investigation page reports the nearby apple tree was cleared of fruit in the days before the camera was installed in order to find out just what was so assiduously helping itself. If the beast men of the silent hills were driven down to the lowlands to feed, they must be hard up to settle for apples. There must be any number of pets and livestock open to predation, if the beast men lack the gumption to go after humans in their own territory. Or maybe it suggests the life cycle of the creatures: the young, such as what that hump in the picture might be, feed on plant matter. The hunger for raw meat comes with adolescence, peaking and carrying on through adulthood to dotage. From there, he tells us about semanticores, “monsters twisted out of shape by language.” A nightmare didn’t start out involving female horses, but the visual pun in Fuseli’s The Nightmare created and spread the image, twisting nightmares come to life. And then there is the pandamonium. All right, I will — in my own way, of course. I watched a good bit of Fraggle Rock when I was younger, thanks to it airing on terrestrial CBC, which was carried on the local cable system, since northern Vermont’s on the US-Canadian border. I don’t know how much I was paid attention to the ecology presented in the show, but it couldn’t have been much, because I revisited the show a couple years ago and got it all twisted around in my memory. There are four key elements in the cycle of life in Fraggle Rock — the place, not the show — doozers, fraggles, gorgs and radishes. They have a relatively complex web of relationships in the show, but my foggy brain made it much darker. For years, the way I remembered it was like this: doozers, the little green guys in hard hats, harvest radishes, using the material to build structures, tools and everything else used in their lives. Fraggles, the slightly larger little guys who sing and dance all day, snack on the radish-based constructions whenever the mood strikes them. In addition to keeping themselves alive and sufficiently energized to sing and dance all day, the fraggles’ actions also ensure the doozers have space to build continuously, as doozers lack the wherewithal to destroy their own work. Meanwhile, the gorgs, big, hairy, galumphing human analogues, do two things. They raise vegetables, thus providing the doozers with raw materials via radishes, but also eat fraggles as a protein source. The gorg’s waste, organic and otherwise, all go into the trash heap, Marjory, a living, thinking entity who is the fraggles’ source of wisdom and guidance. In this scenario, fraggles are not only consumers, but the consumed. And their remains wind up in a trash heap, providing an agglomerated font of wisdom for the community. This is wrong. And it’s unsurprising it’s wrong, because that’s awfully grim for a puppet show meant to teach children how to learn and share and junk like that. A couple years ago, I revisited Fraggle Rock and was surprised by how things actually work down in the Rock. Yes, doozers build things out of radishes and fraggles eat those things in a symbiotic relationship. And in addition to doozer structures, fraggles also eat raw radishes; indeed, it constitutes the basis of a great many of the meals they create, up to and including radish beer. However, gorgs regard fraggles as vermin, not food. Ma and Pa Gorg spend a great deal of time setting Junior Gorg the task of getting rid of the fraggles infestation. And the vibrant fraggle population just out of a gorg arm’s reach is a testament to Junior’s ineffectual efforts. Interestingly, the Wikipedia article notes that certain episodes of the series imply the surplus of fraggles is atypical in the gorgs’ world. Maybe it’s because of Junior’s ineptitude or maybe the Rock is the central colony of fraggles from which all others disseminate. They get the wandering fever, as Uncle Traveling Matt did, only eventually settling down. So all three populations are in competition for the radishes, each with their own use for them. The doozers build, the fraggles eat and the gorgs make a cream to stop themselves from vanishing. The gorgs have an advantage in that they have agricultural skills. The fraggles can eat doozer architecture or go get their own from the gorgs’ garden. And the doozers . . . well, the doozers probably have their own means of harvesting radishes, probably in a more discreet way than sending Mokey out into the garden. An artist's impression of the witnesses' description of the entity. 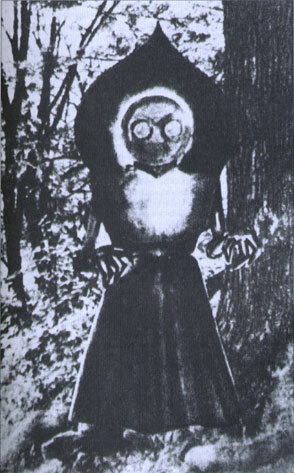 The Flatwoods Monster is one of the more oddball UFO incidents of the 1950s. It has all the classic components of an archetypal close encounter: an object crashes in the woods of Flatwoods, West Virginia. Frightened locals investigate the disturbance, whereupon they run into a bizarre, inhuman creature with glowing eyes, claw-like digits and . . . a skirt. At least, that’s how they described it to authorities, so that’s how the rendering artist portrayed it, which took a great deal of the edge off the encounter as it made the news circuits of the day. 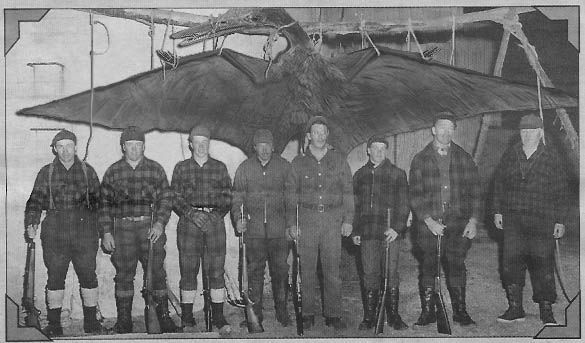 Some skeptics suggested the “monster” was a confluence of a startled barn owl, opportune tricks of light and shadow that gave it a wholly imaginary shape and mass and frightened observers already predisposed to be jumpy by a falling meteorite and unexpected aerial navigation beacon. Now, Frank Feschino, on the other hand, author of Shoot Them Down! : The Flying Saucer Air Wars of 1952, maintains those West Virginians saw the operator of the object in some kind of flight or possibly encounter suit. In this version, the claws become remote manipulator arms and the skirt a propulsion / levitation unit, as witnesses said the thing floated above the ground. In fact, it could even have been a drone or automaton, attached to the object as a repair unit. In the world of the Cabal, this very nearly escalated into a full-blown diplomatic incident between the reptoids and the surface dwellers. While the reptoid nation largely follows the leadership of King S’sathurax, there are always elements whose loyalty to a given leader is greater or lesser than the majority of the population. In this instance, a flight pod piloted by a member of the fractious House Sharpfang violated the treaty between the reptoid nation and the Cabal that reptoids would not reveal their existence to the masses of humanity. If not for some quick-witted cabalists inserting themselves into the situation as both officials to indirectly ridicule the witnesses’ reports and ostensibly clumsy Men in Black who couldn’t decide if they were Treasury Department agents or reporters, the populace might have given the Flatwoods encounter more credence. It’s like something out of Unknown Armies. An avatar of the Green Mother uses its channel of abundance to grow over-sized cockroaches, then unleashes them against the populace in an attempt to advance the archetype’s causes of wild growth. Alternately, it’s a page ripped from GURPS Cabal or even Mutants & Masterminds‘ Freedom City: the reptoids — or the mole people, lead by Terra King, depending on your poison — stage a morale-boosting action against the cockroach men, driving them from the upper-most levels of the Inner-Earth cave system into the sub-basements and sewers of the surface world. Fun ensues as the cockroaches make variously peaceful and violent advances to humans, depending on which faction of cockroach society they identify with, and human authorities come into conflict with the reptoid nation when they try to drive the displaced roaches back down below.